Hawks are by far the supreme predators in the Laurel Lake area. Hawks are called raptors. 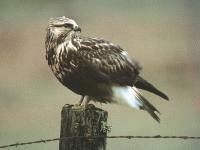 It has been said that the eyesight of hawks is as sharp as that of humans looking through 8 power binoculars. Hawks have strong, sharp beaks. The size of the billsand feet vary in relation to species. A snap from their hooked beak can crush the skull of small mammals or break the prey's back. The hearing of hawks is acute andthey possess poor smell. While hunting, hawks soar high. When hawks strike, they spread the tendons in their feet. Upon impact, the hawk drives its talons deep into its prey. These birds may eat immediately after a kill, or they may carry thekill off. Hours following eating, the hawk will regurgitate a pellet containing fur, bone, or feathers. Adult females are usually larger than their mates. Many hawks mate for life. They build their nests high above the earth on rock ledges and strong branches. Nests are composed of losely packed leaves. After mating, the pair will build a nest or remodel an existing nest. The female begins incubation before the last egg is laid resulting in young of different sizes in the same brood. The female does most of the incubating and the male does most of the feeding. Newly hatched hawks are lacking in feathers. After approximately 2 weeks, the young hawks need little brooding. At this time, the female joins the male in seeking food. 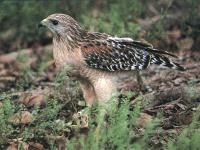 Hawks control rodents, insects, and small bird populations. Many hawks fly south each autumn. Species migrating in greatest numbers are those whose food supply is threatened.